Wanted to share a pic of me wearing the cardigan, which I wore yesterday before heading out with my guy for the day. Despite it being a dreary & rainy day it was good to have the day off & spending it out and about. This is the second time wearing it and so far I am still pleased with the hemline. I will definitely make another one.... I have been checking out Knit Picks Cotton Linen yarn... just need to decide on a color & how many balls I will need. I received the Chadwicks catalogue and like several of its sweaters, especially the crochet shrug and can visualize wearing that with a tank top and linen pants. On the sewing front, I was hoping to complete another OTT before the April 15th deadline, but didn't make it. As is often said, better late than never. This is... mmmm not sure at this point.... I think my 4th top from McCalls 6078. 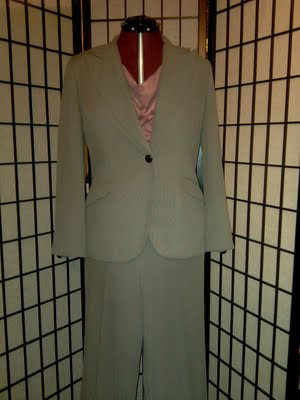 It's a quick sew and really like the drape of the neckline and worked it up using a thin knit in mauve. I did version B again, mmmm.... what else could I say about this top, it works well under my suit jacket and during the warmer months will be worn with shorts and/or jeans for a more casual look. A Thank You goes to Faye, who has done another awesome job of hosting her sewing challenge, and as before allows me to add something new to my old garments. 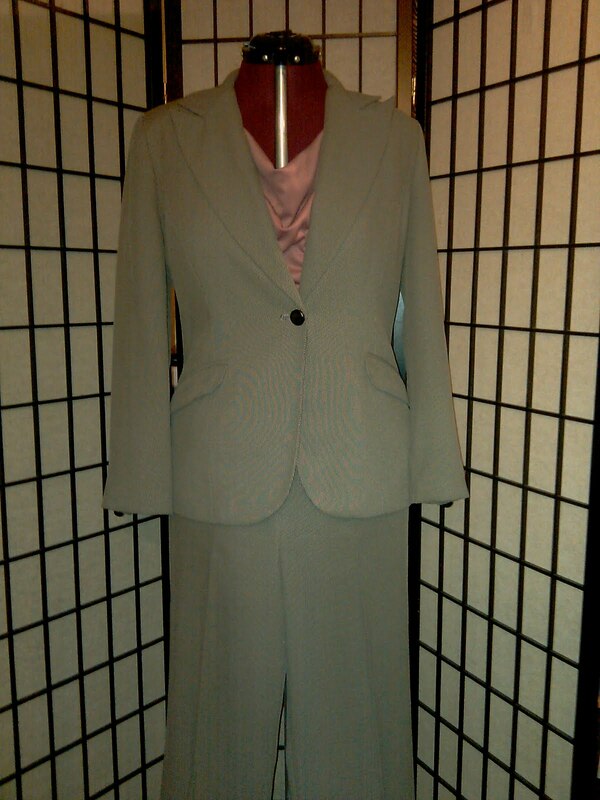 The suit is rtw, circa 2007 from Larry Levine Signature line. I have joined the Bottoms-Up Challenge and managed to cut out pants for the challenge. The pants will be paired with a jacket that was also cut from the same fabric in an attempt to meet my suit-a-month challenge. Until then.... Everyone have a Good Week. Hi Sheila! You are absolutely stylin' in the very cute and classy cardigan and the draped front top! Great looking cardi. I've got this pattern earmarked for this week. Hope mine turns out as nice as yours. Very very nice. I love the color of the cardigan and top. Okay it's just not fair that you look at the Chadwicks catalogue and not only figure out what to sew but also what to crochet! And because of that I'm just not telling you how great the new cardigan looks on you...just not saying it! Wonderful cardi and OTT project. Love that color. Does the top fit well, I've been wanting to make it for a while. That cardigan is gorgeous, love the top too, great color. Another great cardigan! I absolutely love your mauve top! How elegant with your suit! Gorgeous cardigan you look so classy. I just made that pattern for my daughter and think is is fabulous, your shirt is great. 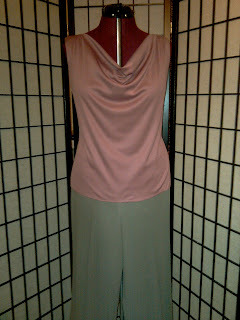 I love the drape neck top. 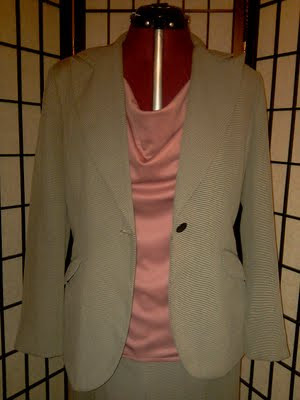 Pretty cardigan, you always do such an awesome job, I love it! 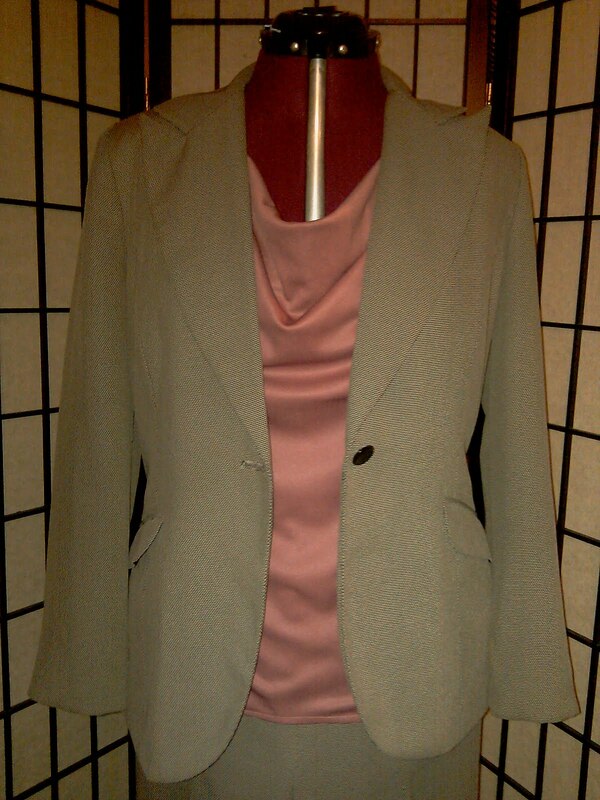 Love the cardigan, and draped front top! Are you coming to Chicago for the PR weekend in a few weeks? Hope to see you if you do! Love your top. I just bought this pattern and I'm planning on making two of the views.